From January 6 through February 7, 2014, Birch Aquarium’s kelp forest exhibit will be off display while minor repairs are made to the tank’s concrete structure. 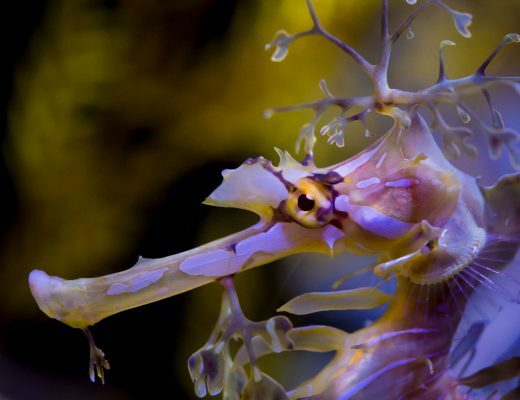 Our aquarists will also use this opportunity to freshen the exhibit’s look with new animals. 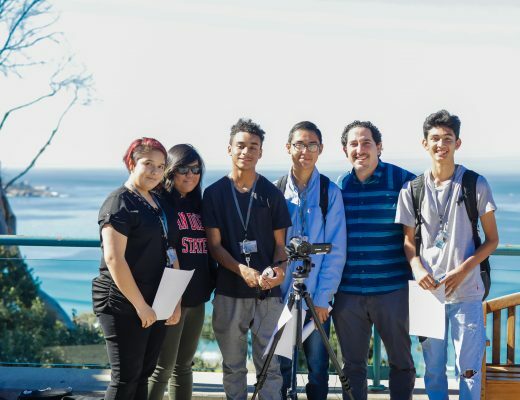 We are grateful for your support so that when the exhibit reopens on February 8 [subject to change], visitors will enjoy an even better representation of Southern California’s kelp forests. Our popular kelp tank dive shows and web cam feeds will also resume at this time. This is the first of three articles describing the construction project and its developments. 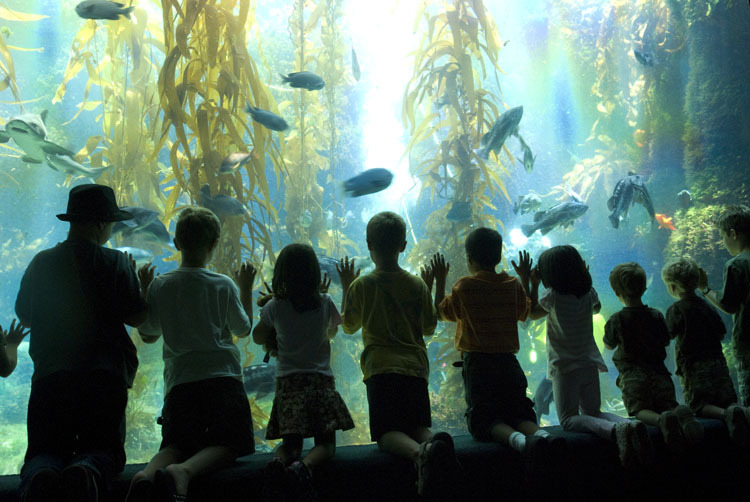 The largest tank at Birch Aquarium at Scripps is the 70,000-gallon kelp forest, located in the Hall of Fishes. Locals and visitors alike enjoy watching leopard sharks, garibaldi, moray eels, and much more swim among the swaying kelp. In spring 2013, a small, slow-leaking crack developed in the tank’s back wall (read on to find out why). Structural engineers confirmed the tank was still safe, but that work was needed to repair the crack to prevent further problems. 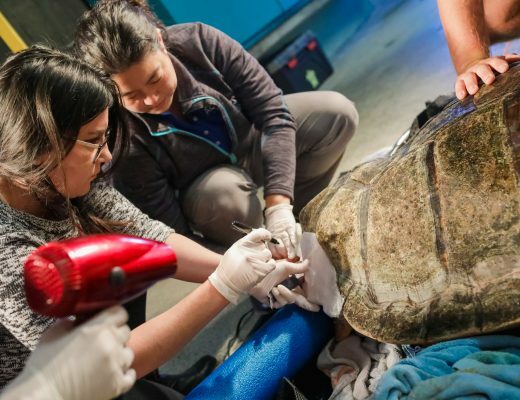 Staff at Birch Aquarium consulted construction experts who felt comfortable that affixing a temporary concrete patch would allow time to plan a high-quality repair. So,eight months of preparation began. A company specializing in the repair of concrete aquarium tanks was consulted to assess the leak’s source. At 280 tons, the seawater in the kelp forest display exerts incredible pressure on the tank’s window and walls. The walls are constructed of sealed, 16-inch-thick concrete reinforced by epoxy-coated steel rebar underneath. But breaches in the rebar’s protective film allow seawater to reach the metal. Seawater—carrying oxygen, carbon dioxide, and salt—reacts with steel and gradually causes it to break down. The resulting rust expands to occupy more space than the initial steel (up to eight times the original volume), generating pressure that pushes outwards on the concrete. And voila, a crack forms. In January, construction efforts will fix the leak and halt further corrosion. Cracks will be dried and sealed using a high-pressure epoxy adhesive. 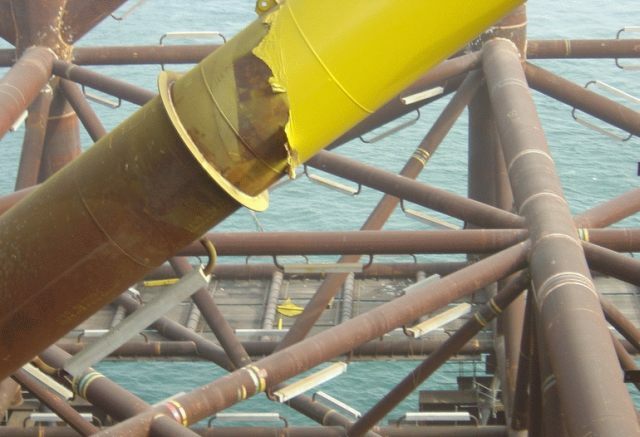 In addition, zinc anodes will be installed to divert corrosion away from the rebar. Because zinc rusts more readily than steel, rebar will be protected from further corrosion. Maritime and transportation industries widely use this method (known as “cathodic protection“) to protect boats and bridges. For more information on zinc anodes: http://dsc.discovery.com/tv-shows/dirty-jobs/videos/zinc-anodes.htm. To be effective, anodes must have direct contact with rusting rebar, so drilling holes into specific areas of the tank’s walls is required. The kelp forest tank must be drained to do this work properly. Draining the tank, of course, requires that the animals and seaweeds be removed. Since June, our aquarists have been gradually moving select fish to different tanks with appropriate habitat in the aquarium. For example, California halibut and shovelnose guitarfish were moved to ElasmoBeach, where they now have more sand to bury themselves in. The rest of the animals currently on display in the kelp forest tank will be moved to temporary tanks onsite but off exhibit. After a month of behind-the-scenes pampering, most of the fishes, including the giant sea bass, will be returned to the kelp forest exhibit. A few may be relocated to other Birch Aquarium tanks or transferred to partner aquariums. In our next post in this series, it’s “moving day” for our fishes! I’m from Susan Moynihan’s math class. She’s having us figure out how long it’s gonna take for the water to be drained. Can someone that works there email me and help me out. And I also would like to know how long is it going to take for the track to be fixed. I would be grateful to know. Hi Kylee, Thanks for your question! I understand your teacher is encouraging you to assume a constant flow rate of water out of the tank, and therefore you can use a linear equation to find out how long it will take to drain the tank. You can use the volume formula to find out how much water is in the tank to begin with, and convert the number of cubic feet to gallons. Finding the flow rate is a little more challenging. You can either create an experiment and gather the data yourself, or find an online resource to get a flow rate. Once you have those 2 values, you can find the time it takes to drain the tank. Good luck!